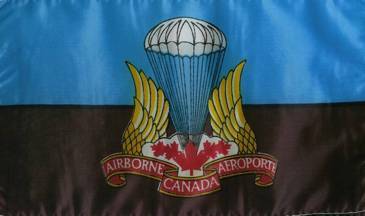 The flag of the Canadian Airborne Regiment which has since been disbanded. An open parachute between two vertical wings with shroud lines issuant from a cloud resting between the bases of the wings. At the junction of the shroud lines and superimposed on the cloud, a single large maple leaf flanked by two smaller maple leaves on each side; the whole resting upon a riband scroll inscribed, AIRBORNE - CANADA - AEROPORTE. Wings of scroll in gold colored finish. Parachute, clouds and maple leaves in silver colour finish.